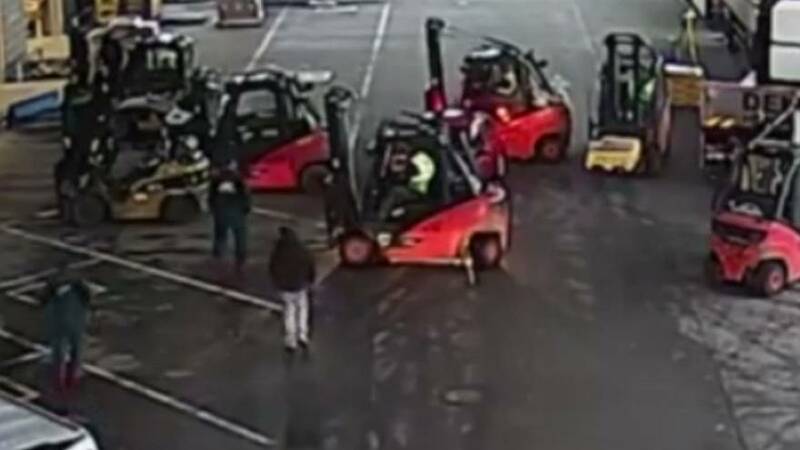 Workers at a warehouse in Ostrava, Czech Republic, foiled a suspected robbery earlier this month by using forklifts to block the getaway vehicle. Footage of the incident, captured on December 5 and released by construction materials provider DEK, shows a red Renault parking next to a white van at the warehouse. In scenes obscured from view, the men in the car then attempted to steal tools from the van without noticing that someone was sitting in the front seat, according to local news site iDNES.cz. After being confronted, the three suspected thieves are then seen attempting to flee the scene in the red car. However, their getaway is foiled by staff at the warehouse who jump onto forklifts to stop the car from leaving. The suspects were later detained by police.